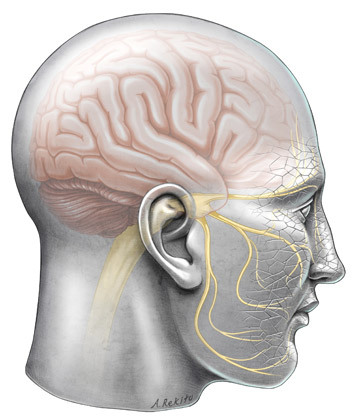 Here at OHSU's Department of Neurological Surgery we have developed a helpful questionnaire for the diagnosis and treatment of patients suffering from varies types of trigeminal neuralgia. 1 ) Do you have facial pain? 2 ) Do you remember exactly where you were the moment your facial pain started? 3 ) When you have pain, is it predominantly in your face (i.e., forehead, eye, cheek, nose, upper/lower jaw, teeth, lips, etc)? 4 ) Do you have pain just on one side of your face? 5 ) When you have pain, is it predominantly deep in your ear? 6 ) When you have pain, is it predominantly in the back of your throat or tongue, near the area of your tonsil? 7 ) Is your pain either entirely or mostly brief (seconds to minutes) and unpredictable sensations (electrical, shocking, stabbing, shooting)? 8 ) Do you have any constant background facial pain (e.g., aching, burning, throbbing, stinging)? 9 ) Do you have constant background facial pain (aching, burning, throbbing, stinging) for more than half of your waking hours? 10 ) Do you have any constant facial numbness? 11 ) Can your pain start by something touching your face (for example, by eating, washing your face, shaving, brushing teeth, wind)? 13 ) Have you ever taken Tegretol ® (carbamazepine), Neurontin ® (gabapentin), Lioresal ® (baclofen), Treleptal ® (oxcarbazepine), Topamax ® (topiramate), Zonegran ® (zonisamide), or any other anticonvulsant medication for your pain? 14 ) Did you ever experience any major reduction in facial pain (partial or complete) from taking any of the medications listed in Question 13, or any anticonvulsant medication? 18 ) Did your pain start after facial zoster or"shingles" rash (Herpes zoster - not to be confused with "fever blisters" around the mouth)? 19 ) Do you have multiple sclerosis? 20 ) Did your pain start after a facial injury? 21 ) Did your pain start only after facial surgery (oral surgery, ENT surgery, plastic surgery)? 22 ) When you place your index finger right in front of your ears on both sides at once and feel your jaw open and close; is this where you predominantly feel pain? DISCLAIMER: Any medical or surgical advice provided in this Web Site, even if intended to be accurate to the best of our knowledge, should be discussed with your medical or surgical practitioner. This website will serve to help direct you (the patient) to appropriate informational resources, and should not be considered a diagnosis. A diagnosis can only be given by an appropriate and experienced physician, after interviewing and examining you (the patient). Only your physician or surgeon knows what is best for you. Always seek direct advice from your physician before embarking on any treatment, medication or therapy. © 2001-2017 Oregon Health & Science University. OHSU is an equal opportunity affirmative action institution.